There have been many books written about boating, and many books written about boat angling – but none about owning and running a small boat written with the requirements of boat anglers in mind. Anglers use their boats very differently from other boating enthusiasts, yet many of the fundamental principles of boat handling, safety and terminology are the same. On the other hand, some of the knowledge required is specific to the sport of boat angling. This book brings together all the subjects of interest to anglers moving into the world of small boat ownership. Read independent reviews below. The second edition is now available as an e-book, downloadable as a .pdf file which you can view on a PC, an iPad, on a Kindle (PC or iPad) or print out, whichever you prefer. It if formatted for A4 print for keeping in a standard ring-binder. Click here and the file will open on your computer. Save the file locally and it is yours! There is no charge for the book but please note the copyright remains with the author and you may not reproduce or distribute without permission. and templates for record sheets. Neville Merritt has been around angling forums for more time than he probably cares to remember, I should think. He’s one of those that website owners notice, as he gives good advice and knows what he’s talking about. He doesn’t see a question, rush off to Google it and then profess to know the answer – he replies if he genuinely knows the answer! So, it was genuinely nice to hear that he’d written a book. I thought that I had a good idea what it would be like before I even saw it. I was right. Angling Boats (A guide to owning and running a small boat for sea angling) is a 144-page manual aimed at those who have either recently purchased a small angling boat, or those thinking about it. It is not a book about angling itself, so please don’t expect to find chapters on rigs, baits, etc. The book covers a wide range of subjects, starting with reasons to buy (or not buy!) a boat and the different types available, right through to what to do if things go wrong at sea and basic maintenance. Each chapter is written in plain English, with clear diagrams where necessary. Safety at sea is not something that should be wrapped in waffle and over-complicated with tricky illustrations. Neville seems very aware of this and tells it to you straight. It’s almost like a text book in that regard, at times; the kind of book that often accompanies RYA training courses. I think that’s what the author set out to achieve….at least, I hope it is, or he won’t like this review much! I’ve completed the RYA Powerboat Level 2 course and, although it’s a very good course, this book gives me a clearer picture of some of the areas that the course brushed over. Areas that are more specific to sea anglers than everyday boaters. For example, anchoring. It would have been very handy for me to have had this book when doing my course. It will also come in very handy when I eventually get my own boat in the water! Angling Boats will become one of those books that will be on the ‘recommend’ list of any boater, when a friend tells them that they’re thinking of venturing into the realm of boat ownership. I can see it selling well for many years for that very reason. It would be nice to see Neville attempt a ‘part two’ next, either on his own or with other authors, covering the angling side of owning a small boat i.e. The baits, rigs and methods not mentioned in this one. If it was written and presented in a similar style, it would make compulsive reading for beginners, especially, as well as experienced boat anglers. 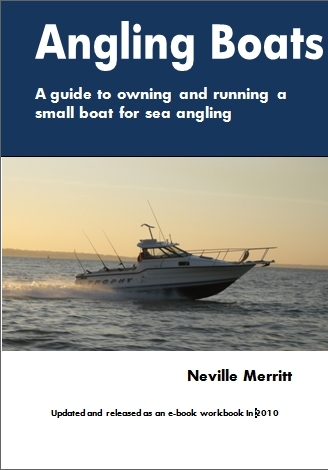 This book is a guide to owning and running a small boat for sea angling. It covers from buying a boat, what types of boat there are, where to keep it with all the pros and cons of owning a boat. Also included is equipment required, both essential and others, safety, regulations, basic navigation, weather forecasts, VHF radios, ropes and knots etc. In fact the book covers everything a novice boat owner needs to know to get started and maybe remind or update information that an experienced owner should know. I read the book and I can honestly say I was most impressed with the content, layout, sketches and good drawings to make it clear what the author is trying to explain. I learnt a lot and I am sure it will be one of those books that are often used to refer back to when trying to find out some information. I would thoroughly recommend this book to a novice boat owner, as there is not that much information available even on the internet and I am sure even some experienced boat owners would learn something from it. November 2006. This is an authoritative book on running a small boat, well written and full of useful information. I read it from cover to cover and found it difficult to put down. I wish it has been available before I bought my boat. It covers everything from maintenance to anchoring, from ropes and tides to taking a fix and using a VHF radio. It contains photographs and line drawings making it easy to understand the instructions within. Having read this book most people would be reasonably safe to take a boat to sea. Obviously there is no better way to learn than experience but you have to learn the basics first, experience comes with time and practice. A must read for all prospective boat owners. “…Neville admits he knows nothing about angling…” ?? Ask any small boat angler if he got a proper night’s sleep the night before he took his own boat out for the very first time and you’ll get a resounding “No” for an answer. Taking your own boat out is a massive responsibility and the more basic knowledge you have at the outset the easier your introduction into running your own boat will be. Neville Merritt’s new book “Angling Boats” is the perfect read for those looking to buy and work their first boat. We instantly liked this book and the way it’s written. The first chapter title is “Why Buy a Boat” and that’s exactly the first question every prospective boat owner should ask themselves. You need to be very sure, before you part with your money, that you really do want to have the responsibility of running your own boat and all that that will entail. It also makes you aware of the true cost of running boats. All too often buyers buy a boat without taking in to consideration all the ancillary equipment they will need, the cost of moorings, maintenance and so much more. Hull design types and their advantages and deficiencies are explained. There are chapters on safety equipment, where to keep your boat and mooring choices. He covers ropes and knots, basic maintenance and DIY, weather forecasts, fishing marks, plus there’s a good chapter on personal care regards sun protection, clothing and sea sickness. The chapters that really took our eye as experienced small boat owners ourselves are the chapters on launching and retrieving, boat handling, anchoring and basic navigation. These chapters are an excellent basic grounding in how to work your boat efficiently and safely from the outset. The chapter on what to do if things go wrong also offers top quality advice regarding medical emergencies; man overboard procedures, breakdowns, flooding and swampings, grounding, getting lost, fog, auxiliary engines and towing. These are all things that will inevitably happen to you at some time, immaterial of how careful and well prepared you are. Having read the book, when problems do arise, you’ll be better prepared to deal with them quickly and efficiently. “Angling Boats” is written in an easy to understand style, using simple line drawings and illustrations, and with black and white photographs. This book can’t buy you experience, but it does offer instant answers to many questions that will occur during your induction in to small boat ownership. Once you’ve read and re read the book, we suggest you slip it in a waterproof sleeve and leave it on the boat as an instant reference. Full of essential information we rate it a top buy for beginners!